This was my first International Federation of Library Associations and Institutions (IFLA) conference. I had no idea what to expect. All I knew is that if IFLA was coming to the U.S., I should go. 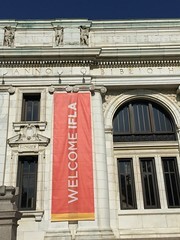 IFLA moves its conference around the world and it only comes to the U.S. about once a decade and its last stop in the U.S. was in 2001. I am impressed in the fact that the conference - the World Library and Information Conference - is truly an international conference. Not only do people travel from approximately 120 countries, but some of the sessions are simultaneously translated into other languages (English, French, Russian, Spanish, Mandarin Chinese, Arabic, and German). Participants were encouraged place a sticker on their badges to signify which language other participants should approach them in. This allowed participants to easily acknowledge language difference. The content of the conference is also international. Sessions frequently contained speakers and perspectives from several national and cultural points of view. This was not a U.S. conference with some international conference. This was an international conference with some U.S. specific content. The Cultural Aspect: Unlike other library conferences I've attended, IFLA has a strong cultural component. The opening session was all about the U.S. culture and lots of Ohio history. It was very entertaining! While some of the cultural history was shown and not explained, it taught me things that I didn't know and which I appreciated. The Tuesday evening cultural event at the Center of Science and Industry (COSI) contained food and entertainment from five regions of the U.S. Yes, the food and music were good, and COSI is an wonderful facility. 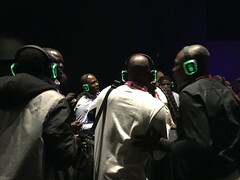 It was also fun watching people try some of the science experience, do country line dancing, and even partake of the silent dance party where participants listened to the music on headsets. 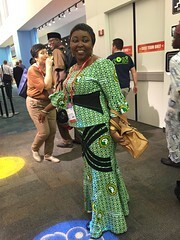 AfLIA: I was really taken by members of the African Library and Information Associations and Institutions (AfLIA), who had clothing made out of fabric that contained the association's logo and name. What an advertisement for their association and what a commitment by them! Could you imagine the ALA, SLA or some other library association logo made into clothing? I can! I can only hope it would be as stylish. Why go to IFLA? Next year's IFLA is in Poland and then it moves to Malaysia in 2018. Traveling all over the world to be involved in IFLA and to attend the conference is a huge financial and time commitment. Clearly there are people - including retired librarians - who believe in having an global impact and doing it through IFLA. If you want a peek into that world or if you want to be a part of that world, then this is the conference for you. I highly recommend attending this conference when it comes close to you (and close is a relative term). You will find it engaging and informing. You will leave with new enthusiasm and with new contacts that you would not have met otherwise. Yes, this is a conference for K-12, public, academic and special librarians. No matter your focus, there is content in this conference for you, as well as people that you should meet. So start saving your dollars. And talk to your boss about what you could learn about and bring back to your organization. Yes, start that conversation now, even though getting to IFLA may be a few years in the future. List of blog posts: Below is the list of posts I wrote about the conference. You will notice a large number of photos, which you may need to click on in order to read. Why so many photos? Some of the content moved quickly and it was easier to take and include photos than to try to type. It also ensured that I captured some of the content correctly. David Ferriero, Archivist of the U.S.
Addendum (08/27/2016):I want to note that the people of Columbus, OH were very welcoming to this international conference. In particular, the bus drivers on the transit system are friendly and extraordinarily helpful, which you don't find everywhere.